Before I review my own data from my overload and deload period, I first wanted to discuss some of the available research that I have pertaining to HRV response to overload training and following recovery. Pichot et al. (2000) monitored HRV in middle distance runners over 3 weeks of intensive training followed by a 1 week recovery week consisting primarily of moderate aerobic work. RMSSD decreased progressively over weeks 1-3 and rebounded to peak values during the recovery week. Pichot et al. (2002) found that RMSSD increased after an aerobic training period in sedentary subjects. After transitioning to a 4 week overload period, RMSSD decreased significantly followed by an abrupt rebound reaching peak values during a 2 week recovery period. In a study by Baumert et al. (2006), baseline HRV values were established prior to training camp in track and field athletes. After week 1 of a 2 week training camp, RMSSD declined significantly. At 3-4 day’s post-training camp, RMSSD started to return toward pre-camp basal values. Though not a comparison for pre and post HRV values following overload, Buchheit et al. (2004) showed that moderate training loads are better than no training or intensive training for the purposes of increasing vagal-related HRV indexes. Their data revealed that moderately trained individuals had higher basal HRV values compared to sedentary and highly trained individuals. In older posts I discussed my experimentation with not taking planned deload weeks but rather reducing training loads on days when HRV was low. This method of managing training loads worked very well during times of consistent, albeit, relatively unchanging training. However, due to work/travel schedules and other set-backs I really didn’t plan any overload training. I was mostly doing my best at not losing strength. A feat much easier to accomplish than gaining strength. At the present time, I believe that one can get away without doing week long deloads at fixed intervals (every 4th week or so) if training is managed on a daily basis. However, by design, this set-up really doesn’t allow for overreaching as you would back off as soon as your trend declined for too long. It was my goal in my latest training cycle to not focus on daily HRV changes but instead evaluate weekly changes. My training, though still manipulated slightly on a day to day basis (particularly in week 4 of the cycle) was much more pre-planned than I had been doing previously. My training set-up was designed so that HRV would return to above baseline after each weekend.. which it did. The purpose of this was to be fresh for the beginning of each week and to avoid premature overreaching. A deload was planned following the last week of the cycle. During week 6 and 7 of my trend HRV baseline reached peak values since the holidays. However, during weeks 8-9 HRV steadily decreases. In fact, in week 9, HRV remains below baseline until the weekend. Typically my HRV will come back up after a recovery day on Wednesdays. The difference between weeks 6-7, 8-9, and 10 are volume and intensity related. During weeks 6-7 my training volume reduced and my intensity increased only slightly. In week 6, it is reasonable to say that I reduced more stress than I added based on volume and intensity change and sRPE. In week 7 however, there are 2 sRPEs of 9 which marks the initial decent in the trend. During weeks 8-9, volume reduced only slightly but intensity increased to near maximal in week 8 and as close to maximal as I could get in week 9. In that 14 day period I performed 8 workouts of near maximal or at maximal intensity on my main barbell lifts. It was also during these last two weeks of the training cycle that I experienced nagging pains, high levels of soreness etc. Though weeks 8 and 9 are the most taxing, my sRPE doesn’t change all that much (primarily 8’s with a rare 9). This does not do a good job of reflecting the change in volume/intensity. Perhaps I need to re-evaluate my current method of rating workouts and tracking training load. 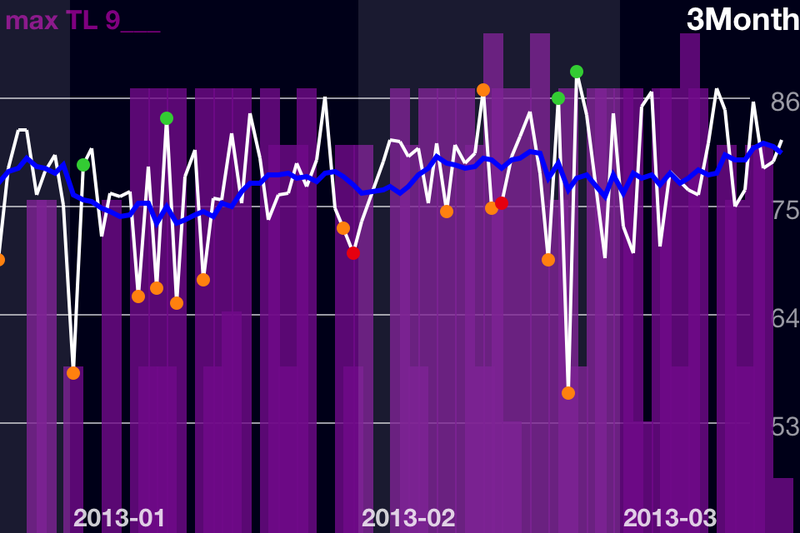 Week 10 is a deload week and HRV returns to peak levels. Soft tissue problems progressively resolve and I’m anxious to start a new cycle. HRV will likely decline during intensive training and return to baseline following a recovery period of reduced training loads. Perhaps focusing more on weekly changes in HRV as opposed to daily acute changes is more meaningful during overload periods; permitting a more controllable approach to overreaching. Baumert, M. et al. (2006) Changes in heart rate variability of athletes during a training camp. Biomed Tech, 51(4): 201-4. Buchheit, M., et al. (2004) Effects of increased training load on vagal-related indexes of heart rate variability: a novel sleep approach. American Journal of Physiology – Heart & Circulatory Physiology, doi:10.1152/ajpheart.00490.2004. Iellamo, F., Pigozzi, F., Spataro, A., Lucini, D., & Pagani, M. (2004) T-wave and heart rate variability changes to assess training in world class athletes. Medicine & Science in Sports and Exercise, 36(8): 1342-1346. Pichot, V., Busso, T., Roche, F., Gartet, M., Costes, F., Duverney, D., Lacour, J., & Barthelemy, J. (2002) Autonomic adaptations to intensive overload training periods: a laboratory study. Medicine & Science in Sports & Exercise, 34(10), 1660-1666. Pichot, V., et al. (2000) Relation between heart rate variability and training load in middle-distance runners. Medicine & Science in Sport & Exercise, 32(10): 1729-36. This entry was posted in Heart Rate Variability, Training Log and tagged deload, heart rate variability, HRV, overreaching, taper. Bookmark the permalink.